Blackness fades to a cliff scene…. Don’t let the beautiful view fool you, things are about to get pretty ugly! Work your way through a small group of buildings and into an underground Combine base. Can you escape after stealing a sample from near the thumpers (That’s a clue if you get stuck)? This is a design test which I had to complete in 10 days for the studio I have recently signed with. I am releasing it to the community purely for the purpose of providing an insight into what a formal design test looks like and what one person accomplished in 10 days. Obviously 10 days is definitely not enough time to fully complete a level like this, so this is more a representation of my improvisational skills, as it was essentially done in a spontaneous manner. I wasn’t sure what the studio was expecting, so I tried to make an arcing experience with certain moments fleshed out to a degree that you could tell what I was going for. Lighting is purely functional, optimization is nearly non-existent, sound was a last minute addition, scripting is very superficial, and the brushwork was only enough to communicate the basic idea. Copy the MikeAnderson_LevTest folder into your SourceMods folder. 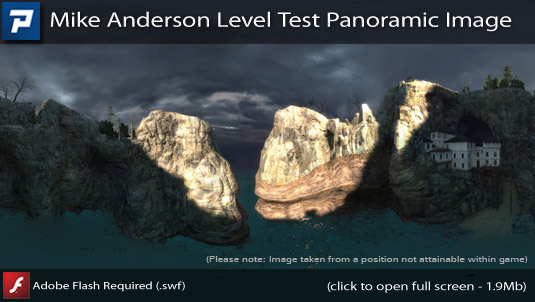 Mke Anderson Level Test should now be listed in your Library tab. I really enjoyed this level and I am pretty sure you will too. Please make sure you read the author’s note, so you understand the reason it was built and especially how long it took. I liked the option of entering the building at the beginning but found the initial underground section quite hard, even on easy. All in all a great piece of work. After the first fire fight in the cave I’m having huge frame rate problems. The map has become unplayable. I’ll have another bash after my next boot and turn my graphics settings down. Pity because it looked great up until then. I knocked it down to my setting of 1024 x 768. Improved but still stuttery. Knocked it down to 800 x 600 (dear me) and it worked just fine. I can’t find the actual level design test. Looking at it would give an interesting perspective to the level before I play it. Due to privacy issues no exact details of the test requirements have been released. Visuals were good. Lovely in fact. I was not keen on the combat though. I like Combat mods. First firefight in the tunnel, in the dark was tedious and tiresome. No chance to implement any sort of game plan – just shoot. Then the firefight in the dome. Collect the sample, dash up a ladder, hide behind some boxes dispose of half-a-dozen manhacks and a couple of Elite. Then an escape “Run & Gun” while underfire from a Gunship. Many might like this. I didn’t. For me this was not play, it was work. No need to engage brain. Perhaps this was a route finding test. Which ladders to use in the dome. If so it was easy enough. I wish I could be more positive Mike, I really do, but as a gaming mod, I find no replay value here. I agree with you bud. The firefights were very tedious overall, and the one in the tunnel is even hard for me. In 10 days, I basically could only afford to focus on one encounter and make it work. That was the first one outside, which still wasn’t fully fleshed out. Most of my time was spent on the visuals. 10 days man! Well, you achieved your objective then. It is a reasonable assumption that the ‘studio” is connected with gaming. I felt it important for you to know how this was received by a player regarding gameplay and combat. Hard combat fazes me not at all. Boring and tedious combat, is, like I said, work. However, on re-reading your reply, I see that you agree. Good luck but, with your undoubted talents, I strongly suspect that you don’t need it. For 10 days, very good indeed! It was a bit too dark, and the Combine had clearly been eating more carrots than me, but impressive nonetheless. I had one glitch – the door in the huge chamber with manhacks behind it didn’t open. Maybe I missed something, but could find no switches or anything to operate it and in the end noclipped through. The start, with the beautiful vista across the bay, was a great way to draw the player in. I added a clue in the mod’s description. yeah. I guess that wasn’t made very clear. That’s one of the things 10 days doesn’t allow – playtests. My main concern was the same as with everyone else, the fight in the tunnel. I died 5 times and even when I actually survived, I had no idea what was going on what I was shooting at. This is a pretty impressive achievement considering it was done in 10 days. The level looks great. I’m a bit surprised that not more time was dedicated to gameplay over visuals, as this was a level design test? I guess it’s safer to go for the visual approach, as more elaborate gameplay content would require more playtesting and tweaking. Still, the gameplay was good despite the tunnel encounter. the start area was Brilliant, the first bit of the cave was brilliant, then It got really bad, (I too had to lower my graphics) and the main cave fight was tedious as his use of fog, although added to the ambiance, had me stumbling around in the dark. often times I would end up being turned around but eventually I stumbled into the main area, which was great as I was not expecting it, so it brought a breath of fresh air as all the fps lag disappeared with the fog. I got a bit lost in this section, but I had fun climbing the sides, then jumping off…after that it was a joy ride. Overall design was very nice. 10 days limit really impressed me, creating something like this in 10 days is quite something. I didn’t find it challenging as others did though, it was pretty simple with all that ammo and stuff. Maybe it’s because I never jump into battles without taking cover. Looks good, plays good enough. Had little performance issues in the cave but I suggest this map to all players. I didn’t have any performance issues, though I did have trouble actually finding the right door at the very top of that room to exit the sample cavern. All in all, I certainly hope that your ‘test” is graded highly, because this is an extremely good map. Whoa! That was a fun five minutes. After reading the authors notes I wasn’t expecting much, but I was pleasantly surprised. As I’m not a mapper or modder I can’t comment on the technicalities, but as a player I enjoyed it. I really would like the author to expand this into something much bigger because if this is only a test piece I definitely want more. The only negative I can think of is the combat could have been harder. As for the visuals, they looked pretty good to me especially opening location and in the cavern. I’m a bit surprised about some of the performance issues that have been described, as I ran this at 1680×1050 with only a slight stutter in the cavern which barely lasted a second or two. I only get those kind of problems when things are running in the background e.g. virus scans, also I disable any unnecessary start up programs that take up memory and CPU. Cant’s say I enjoyed this one, whilst the combat was challenging I never appreciated the dark cave surrounds of the first major encounter, and found the gunship inclusion with the last at the bridged too much for me. I never felt a part of this one with too much stumbling around and wondering where and what next. Overall a disjointed game without any flow or balance to the gameplay, visually are good in places but with frame rate slow downs. To some extent I can imagine that it was put together in a short time, although 10 days seems amazing. Just wanted to say that this was a great gaming experience. Considering you made it in ten days. Congrats. I was one of those that did a rant in Outpost 16’s Moddb page. Not sure if it was your intention, but this little map/mod is way better than that one. Just wonderful terrific idea for a level map, basicly divided in 2 parts the style, you get in-get out, and escape, this map, offers lovly combat. The textures in the cave are very atmospheric and realistic, and the short-real mission style does it even better, I really liked the how the whole concept on this was planed. Tough I feel one of the main shortfalls in this one, is that maybe the combat inside the cave, once u have taken the sample and get out, was a little bit poor, I mean I liked the manhacks attack idea, but i’d preffer to have a hunter battle, that would have make it more challenging, and then the gunship, added extra emotion, but I felt those missing hunters would have closed the circle of this map, perfectly. Then the end escaping by the helicopter, is just cool, also the heli killing the gunship is a very clever scene. Oh and by the way! !, I forgot to mention I loved the whole natural geographical scenario this map recreated, I loved to begin with that really high closed lake or bay, then discover a very deep cave was just a great environment experience! Anyway, is the perfect lenght for a quick lovly gameplay, so Play it now! For ten days, this is pretty impressive. It takes place on an island that’s kind of like Saint Olga from Lost Coast as well as in some caves kind kind of like the Antlion portion of the mines from Episode Two, except with Combine instead of Antlions. It’s rather linear, but in the start I was kind of confused since I had to jump into the water and in environments like this in HL2 water usually means leeches. Other than that, I see no problem with this level. It’s fun but doesn’t have any puzzles, and getting the bugbait was kind of pointless since there’s no Antlions. There was one part I really liked and that’s the end with the Gunship. Usually you get a rocket launcher to kill the Gunships but with this one you just have to run. I recommend this level.